Creating opportunities for our young creative talent drives optimism about Detroit’s future. ArcPrep advances Detroit’s culture of inclusive and pluralistic design empowering emergent and future designers. The Michigan Architecture Prep Program, a University of Michigan Taubman College of Architecture and Urban Planning initiative, introduces high school juniors from Detroit Public Schools to the multi-faceted disciplines of architecture, design and urbanism. Through a semester-long college preparatory studio, students gain an understanding of design’s agency in the world. The Michigan Architecture Prep Program, in partnership with Detroit Public Schools, is dedicated to delivering high-quality design education to Detroit high school students who might otherwise not have access to the field. With the goal of exposing young talent to the professional disciplines of architecture, urbanism and design, the program offers experiential learning in an intensive studio environment modeled after the undergraduate studios at the University of Michigan. Offering the first-hand experience of a top-rated architecture program in order to develop a more divers, versatile and empowered generation of designers, it is the only initiative of its kind in the nation. Strategically, ArcPrep provides students with a breadth of learning experiences beyond the classroom: exposure to local design firms and construction sites; connection to community initiatives; participation in workshops, exhibitions and academic reviews; introduction to college-level lectures and professional panel discussions; and bonds with graduate student mentors. In this framework, students learn to excel through direct contact with local and national design leaders. 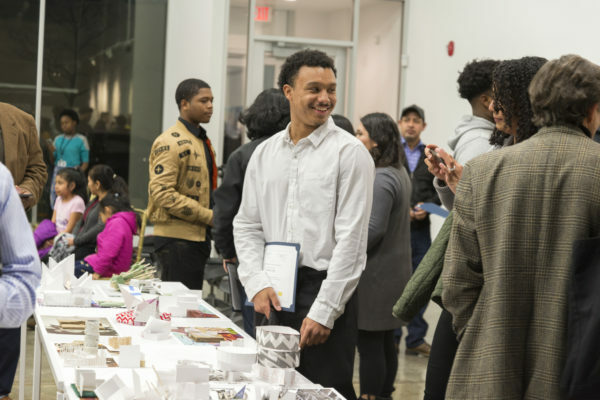 In addition, the program facilitates a paid summer internship program with a prominent Detroit architecture firm, as well as offers students additional portfolio building opportunities through the university’s summer programs.